Given the choice, Peter Saturno would probably choose smallpox over small talk. The 54-year-young co-founder and president of Midhaven Homes cuts through the bull like he’s wielding a Samurai sword. He probably sharpens his wit with it too. 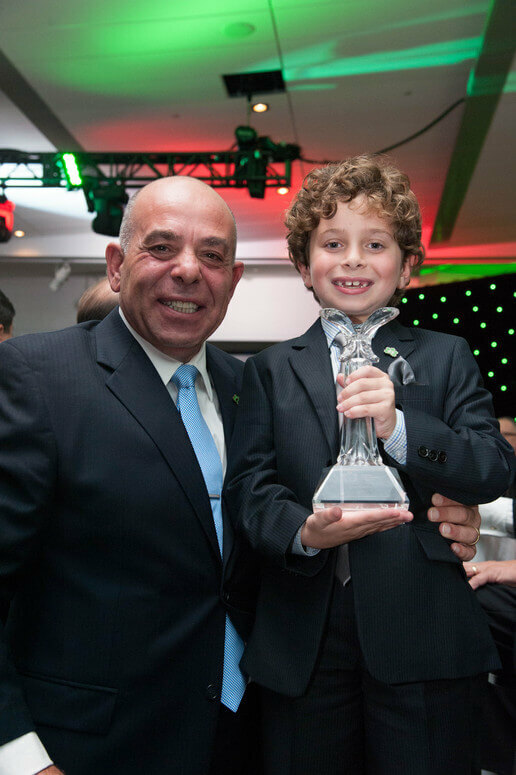 But even if you’d never heard the man speak—and it’s always an engaging experience—on paper alone Saturno was well worthy of the Lifetime Achievement Award presented to him at the OHBA’s President’s Gala on Sept. 23 at the Ottawa Convention Centre. Saturno has been an active association member since 1993, having served as both Durham Region Home Builders’ Association president in 1999-2000 and as OHBA president in 2003-2004. He has worked with the OHBA Builders’ Council, Tarion Liaison Committee, Technical Committee and Economic Review Committee. In addition, he was instrumental in the success of the EnerQuality Corporation. As an Energy Star builder, Saturno has been a longtime advocate for leading-edge energy efficiency programs and served on the EnerQuality Board of Directors from 2005-2013. He also served on the Board of Directors for the Tarion Warranty Corporation from 2004-2014 and was a strong advocate for both Ontario’s homebuyers and builders. More recently, he represented Durham region developers on a special working committee on Oshawa Development Charges (DCs). The work resulted in millions of dollars in savings for new-home buyers across the region. “I’ve got to be honest—I was floored by receiving the award,” says Saturno. “I was truly humbled and touched by it, because when you do something as a volunteer organization, you don’t do it with some end award in sight, you do it because it is good for our customers and our business. I feel I should be giving the OHBA an award. 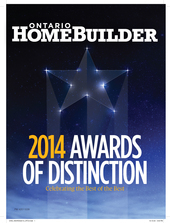 OHBA members build the best house in Canada, North America—even the world. I’d love to share a piece of this award with everyone who makes their living in this industry. Saturno used that blunt approach to effect massive change in how OHBA plans were viewed by government during his presidential tenure. “One thing I am proud of is getting our message across to the new Liberal government in 2003-2004. They weren’t our biggest fans back then. I remember meeting with Minister of Consumer and Business Services Jim Watson, and we got off on the wrong foot in our first meeting. After a few months, we were like the best of friends, and we still keep in touch now that he is the mayor of Ottawa. Same with then-Minister of Municipal Affairs and Housing John Gerretsen—again, meetings where there is a dichotomy in the room. Six months down the road we were consulting with each other. Same thing with David Caplan and George Smitherman.